Hi, all. I’m just back from a great trip to London. I knew I’d be reading a lot and hopefully writing and was trying to figure out the best way to do this. I came to the conclusion that I should get a keyboard for my iPad and also load it with e-books. I could even put a London travel app on it and have only 1 thing to carry with me. Well, this might have been perfect, had I the foresight to download and practice on the word processing programs before I left. I’ve since learned that the hour before the car comes to pick you up for the airport is not the time. Turns out my iPad isn’t updated enough for the current word processing apps (it’s a very, very old iPad–6 months. The woman on the Apple help phone told me it was several versions outdated. Amazing how technology can whoosh by you in a mere 6 months.) and the keyboard that seemed so great when I bought it at Brookstone wasn’t that great either. Oh well. However, I did download several books. This wound up being extremely helpful when my husband, Mat, was sleeping and jet lagged-me was still awake. The lighting on the iPad is just enough to read, but not enough to wake the guy next to you. A lovely friend had given Mat a Kindle and he used it on our last vacation. If you have a Kindle app for the iPad, you can also read the books on the Kindle. Turns out a Kindle is much lighter than a regular book and great to stuff in your bag when you’re touring. I felt guilty–I realized I was really enjoying this e-book thing. Nothing replaces the smell, feel and rhythm of a book. No matter what people say, I don’t think it’s so easy to find that phrase or plot point you want to find, when you’re flipping back through an e-book. And you can’t read them when a plane is taking off or landing, so make sure you have something else to do during that time. You also can’t share a favorite book with someone else if you’ve bought it for an e-reader. There’s a bit of a loss at not being able to pass on your copy of a beloved novel. So I’m not on board 100% with this e-book stuff. But I think I’ll wind up with more of a mix than I previously allowed myself. Maybe it’s okay to like e-readers. It doesn’t mean I don’t like books, it’s just another way to enjoy them. Hi, everyone. It’s been a while since the last Writer Wednesday, but we’re back! This week we have my fellow WestSide author, C. Lee McKenzie, author of Sliding on the Edge and The Princess of Las Pulgas. For the first time in recent memory, I read a book in one day. Something about Princess just kept me reading (and I guess for some reason my kids left me alone and let me read). Both of these books are examples of why I’m proud to be a WestSide author. Native Californian C. Lee McKenzie has always been a writer. But she’s also been a university professor and administrator, and for five years, she wrote and published a newsletter for university professors. 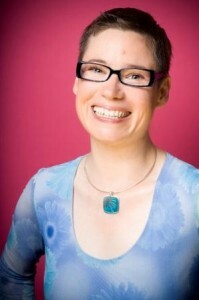 She’s published articles on linguistics and intercultural communication, as well as on general magazine topics. Her fiction and nonfiction for young readers has been published in the award-winning e-zine, Stories for Children, and Crow Toes Quarterly has published her ghostly tales. Writing for teenagers keeps Lee in touch with young members of her family, and lets her revisit those wonderful teen years when everything is possible. When she isn’t writing, Lee hikes in the Santa Cruz Mountains in Los Gatos, California. Carlie Edmund has everything: a loving family, good friends, a perfect home and wealth and status; then in her junior year of high school all of that changes. How will Carlie take on the challenges of living in a different world, a world where she doesn’t “fit” and where nothing is as it should be? 1. 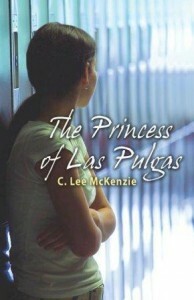 I just finished The Princess of Las Pulgas and cried through the first 155 pages as I absorbed Carlie’s pain and loss. Did you base this on a specific experience? What inspired you to write this book? Wow! The first 155 pages, crying! Â I guess I did treat poor Carlie rather badly. You’re the second person today that’s told me she cried for my MC. nothing?” So that’s where Princess began and it began before the economic downturn, so I didn’t set out to be a topical author on this one. It just happened. 2. We are both published by WestSide Books. Your book, Sliding on the Edge was one of the original books they published. How did you find WestSide and what was your road to publication on Sliding like? book interesting because I knew nothing about the business. However, the editor was patient with me and when she made suggestions I took them. She knew a heck of a lot more than I did. 3. 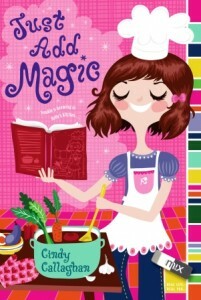 Did you have a different writing process for Princess than for your first book, Sliding on the Edge? Oh yes, very different. Sliding started when I read a news article about Ivy League students who self-abused. It disturbed me to think that “successful” kids were cutting and burning themselves, so I wanted to know why and I planned to write about it. I just didn’t know it would be a novel. I’d thought about doing an article, but that didn’t happen. Also once I started the novel it came down pretty much the way I envisioned the story–first this and then that. Princess came down in random chunks, scenes I guess you’d say, Â and it was a very different story than what was finally published. I took out a major thread, added more depth to my MC’s character and changed some of the minor characters’ Â personalities. My editor was great in guiding me on book two. 4. What’s the nicest thing someone has said about either of your books? The nicest thing is that it touched them in some way. They could relate to the people (They didn’t say characters.). Some said they didn’t want the book to end. Â All of these comments were very gratifying. One reader asked me what happened after the story ended. IÂ thought that was interesting. He (Yes, an adult male person–a cardiologist who I don’t know, but ferreted me out at a gathering) had all kinds of questions and none of them were literary; they were all as if the people in the book were real. I thoughtÂ that was quite a compliment. I also I had to scramble to figure out what to say in response to his questions. Now I have answers and maybe I’ll write a book about what happens after the book ends–a book 2? That would be interesting. 5. Have you gotten any letters or reader reactions that surprised you? This was a big surprise and kept me writing on my fourth book. I was thinking of moving on to other endeavors. I grew up all over the place, but all in California. Guess it’s good that it’s a big state, so when I say all over the place I can really mean it. I started in a northern valley in a town called Modesto. From there I moved to another valley town called Patterson, then San Diego, Alhambra, San Bernadino, El Monte. North again. This time to Gilroy (the garlic capital of the world, YAY! ), San Jose, San Francisco, Los Gatos–my angle of repose place. And when I was 15 I was definitely going to be an archeologist. I wanted to find another Troy or dig in the Valley of the Kings. That didn’t happen, but I still love to read about archeological finds and in my next book I indulge myself in a bit of Egyptology. 7. Where did you go to college? What was your favorite course there? I went to San Jose State University and my favorite course was something called Correlation of the Arts. A brilliant course that integrated literature, architecture, science, music and geography. I never missed one of those classes. My next favorite, if I can go there, was Psycholinguistics. It really opened me to understanding how theÂ mind works and how language and culture interact to create who we are. My family wonders about me sometimes when I get excited about synapses and neurolinguistic programing articles. Can’t help myself. 8. Besides writing, what do you do to fill your days? I love this question. I keep asking for more hours in the day, but nobody’s listening! Writing is a big part of my day most days, but when I take a break I hike. I love being outside on a trail and I do that as much a possible. I definitely carve out three hours a week for yoga and I have for years. In the summer I grow my own vegetables, so I do a lot of stuff with dirt starting in March. Outside of that I read, I try to keep in touch with my friends and family and I stare at the trees in the forest where I live, wondering how I could be so lucky to have them. All of that pretty much takes up the day and I find the only way to even near finishing what I want is to get up about 4AM, which I do, but not every day. Oh dear. I love to eat, so this is the hardest of all your questions. But I guess if I only had one meal left in this world I’d choose bruschetta as an appetizer. For the main course I’d take a freshly made black pasta with prawns and green-lipped mussels, tossed with olive oil and lime and sprinkled with fresh parmesan cheese. (Now I’m hungry.) I seldom eat dessert, but if I did and I was having it with this meal I’d take a cheese with fresh seasonal fruit. If was eating it as a stand alone dish, Hot Fudge Sundae topped with nuts, hands down. Dark. Never Milk. Bitter and with lots of nuts. No nuts? Don’t like it. Well, I could talk about tons of things, but I guess I’ll plug something that’s coming out in October. The 2009 Debutantes, a group I’m very proud of being associated with, has created an anthololgy of short stories. The theme and title is The First Time and it will include every kind of genre imaginable. I was really excited to see the cover and to see all of the great YA people involved. My story is called Premeditated Cat. Hope people will look for it when it comes out. I believe that will be in October. Thanks so much for your time. 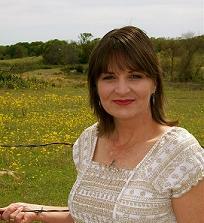 You can learn more about C. Lee McKenzie at her website. It has been an amazing year since my debut novel, Change of Heart, was published. I’ve learned so much this year and thought I’d share some of those things. 1. 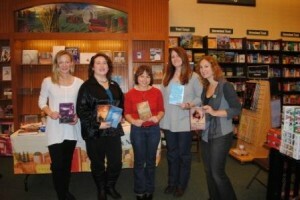 Book signings are much more fun if done with other authors. As a debut author, my signings are sometimes “lightly attended.” If you have a buddy with you, you don’t feel as lonely. 3. AMTRAK is awesome! I took the train to ALA in DC in June, to the Baltimore Book Festival in September and to the Rochester Teen Book Festival in May. I could have driven to any of these places, but the train is so much easier–and with no one around to interrupt me, it’s like a writer’s retreat on wheels. 4. There is no right way to balance promotion and writing. Even the more seasoned authors I have met say they haven’t quite figured it out. The best thing you can do, I guess, is just try to allocate time for each. 5. 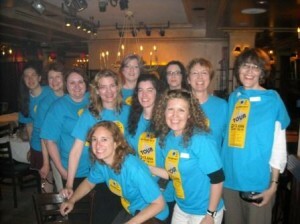 Speaking of seasoned authors–YA and Children’s Authors are a fabulously generous and welcoming bunch. Starting with the giant “welcome to the YA sisterhood” I got when I met Laurie Halse Anderson at a BEA signing last year to hanging out with some terrific, prolific people at the Rochester Teen Book Festival last month, everyone has been so welcoming. You hear horror stories of how competitive adult authors can be and I’ve found nothing but camaraderie and respect in the YA world. Huge fan-girl moment meeting Laurie Halse Anderson! 6. Barnes and Noble will pull your book after 3 months if the sales in an individual store aren’t what they want–but it’s not the end of the world. And no one at B&N could tell me exactly what the magic number was. Because Change of Heart was a little late in being released, it only got about 6 weeks, which is really not a lot of time. That said, after my initial panic, I realized there are a lot of things about being published that you can’t control and Change of Heart still lives on at Amazon, B&N.com, some indies, etc. It was a huge thrill to see my book on the B&N shelves. 7. Never underestimate the value of the hometown crowd. That includes having 300 people at my book launch at the New City Library, great press coverage in the Rockland County Journal-News and New City Patch, being included in the summer reading list for Clarkstown North and South and all of the support our friends and family have given me. 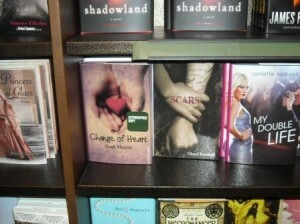 Plus Change of Heart is still in the Nanuet and Palisades B&Ns (see happy exception to #6). Ally, Sam, Brittany and Toni debate "Team Sam" and "Team Abe"
8. Debut groups are invaluable. I was a member of both the Class of 2K10 and The Tenners. It was so great to be able to share the highs and lows of my debut year with people going through exactly what I was. Do you notice a trend? So many of these lessons revolve around the people I’ve met. I think that’s been the nicest surprise of all. I always thought of writing as a solitary pursuit, but this year have realized how awesome it is to have met so many interesting, intelligent people and to be a part of the writing community. 9. There are never enough hours in the day, so do the best you can. And gee, if that means the dishes get done at midnight or ordering a pizza, well, so be it. No one ever died from dirty dishes or too much pizza. Thanks to everyone who made it a great year! This week’s featured author also celebrated her birthday yesterday. 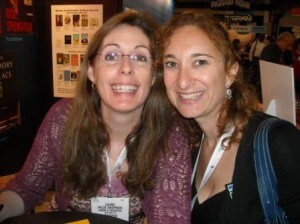 So I’ll start with a big “Happy Birthday” to my wonderful imprint-mate, Beth Fehlbaum. I’m so excited to have her as a guest on the blog today. Her book, Hope in Patience, has been honored by YALSA as a Quick Pick for Reluctant Readers and Beth has been very busy reaching out to readers, both in Texas, where she lives, and in cyberspace. I’m excited to bring back my Writer Wednesdays with an interview with my imprint-mate, Cheryl Rainfield, author of the powerful Scars. Not only has Cheryl’s book racked up accolades and awards, but it has reached so many teens who struggle with self-harm. It was truly one of my favorite books of the year and has been a breakout novel for WestSide Books, which is very exciting for our young imprint. Cheryl Rainfield writes realistic edgy fiction for teens, fantasy for children, and some non-fiction articles for adults. 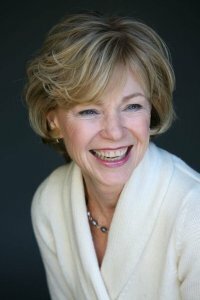 She edits and critiques childrenâ€™s and teen fiction, and on her website she reviews a wide variety of childrenâ€™s and YA books. In addition to writing, Cheryl is also a talented artist. She lives in Toronto. Kendra, fifteen, hasnâ€™t felt safe since she began to recall devastating memories of childhood sexual abuseâ€”especially because she still canâ€™t remember the most important detailâ€”her abuserâ€™s identity. Frightened, Kendra believes someone is always watching and following her, leaving menacing messages only she understands. If she lets her guard down even for a minute, it could cost Kendra her life. To relieve the pressure, Kendra cuts; aside from her brilliantly expressive artwork, itâ€™s her only way of coping. Since her own mother is too self-absorbed to hear her cries for help, Kendra finds support in others instead: from her therapist and her art teacher, from Sandy, the close family friend who encourages her artwork, and from Meghan, the classmate whoâ€™s becoming a friend and maybe more. But the truth about Kendraâ€™s abuse is just waiting to explode, with startling unforeseen consequences. 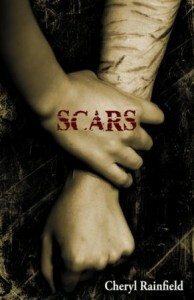 Scars is the unforgettable story of one girlâ€™s frightening path to the truth. 1. I understand that Scars came out of your personal experience. At what point did you decide to write this book and how did you go about doing it? I wrote the initial draft of Scars more than ten years ago. It’s hard to feel alone and in pain, and it’s even harder when people judge you for it. I wanted people to understand, to have more compassion–and I wanted people who had been through it to know they weren’t alone, just as I needed to know that. The first drafts had a lot more getting out the pain, the emotion, the trauma onto the pages, along with story. I poured a lot of my heart and experiences into it. Over time, I edited and rewrote it so that Scars was less raw, and held more hope. 2. Many people are surprised to learn that you used a photograph of your own arms on the cover. How did the idea for this come about? Did it come from WestSide or from you? I mentioned to my publisher that I had a professional photo of my scarred arm and wondered if they’d be willing to look at it. They were–and I’m so grateful! I think it works really well; it tells readers right away what the book is about, without being sensationalist. 3. When I was in college, one of our friends was cutting. What advice would you to give to someone if they thought their friend needed help? Talk to them about it–gently, with compassion. Don’t pressure or back them into a corner. You could ask if they’re seeing a therapist, that that can help a lot, having someone who listens with compassion and cares. If you’re willing to listen without judgment, you can offer that. Educate yourself about self-harm before you talk to your friend. (The Secret Shame website is a *fantastic* resource.) You could bring a book, an article, something you found helpful on the subject, and leave it with them. Most important of any of that is having compassion, caring, and sensitivity. Helping your friend know that they’re not alone, that someone cares, that you see their pain, and are not judging them. 4. What’s the nicest thing someone has said about the book? Hm. There’s been a lot of things! Many readers have told me that before they read Scars, they’d felt so alone, like no one understood, and that after reading Scars, they felt like someone finally understood. Many readers who’ve used self-harm have told me that they’ve been able to tell a good friend, or seek out therapy after reading Scars, and/or that they have been able to stop or reduce their self-harm after reading Scars. That’s such an incredible response; more than I’d hoped for! A few readers told me that before reading Scars, they could never understand how anyone could hurt themselves, but that after reading Scars, they really got it. All of those responses make me feel so good! My personal experience with self-harm is that it comes out of abuse and trauma, and of course deep emotional pain. I’ve seen that in others who I’ve known who used self-harm, too. So I was at first surprised when a queer reader told me that he hadn’t been abused but used self harm to cope. But of course, emotional pain often comes up in being queer in our homophobic society, with people not accepting who we are, who we love, and it can be a real torment, especially when you’re a teen and your parents don’t accept or understand you–or even hate you for who you love. 6. I know that you write both fantasy and realistic fiction. Do you approach each of these genres differently or is your writing process for each similar? For me, the writing process is similar. I start with an idea, an issue that I want to delve into that is close to my heart, one that is a part of my experience or relates to my experience or is something I care about. I write a rough first draft, then edit a lot, look at the shape of the story and try to make sure it’s working. I try to write about what I care about, what I love, what I need. I write about what moves me, and I try to make it real on an emotional level. 7. And the important question: Favorite Chocolate–Dark, Milk or White? Milk chocolate. (smiling) I love it! Though I now have to have sugar-free chocolate, and sometimes it’s hard to find brands that taste good. I’m always grateful when I do. Thanks so much for joining me today, Cheryl. To read more about Cheryl, visit her website. I’m setting aside Writer Wednesday and the usual blog post to borrow this space and give some information on an upcoming event. Hoops 4 Dana is a 3 on 3 Basketball Tournament celebrating the life of Dana Sassano, a senior at Clarkstown North who we lost this past December in a horrible car accident. The Tournament is Sunday, March 27th in the gym at Clarkstown High School North. All proceeds to go to the Friends of Dana, which will support a scholarship in her name, as well as to continue Dana’s mission of helping people in need. Teams can have 3-4 members and there will be a running time of 5 minutes per game. It is double elimination, so everyone is guaranteed at least 2 games. DEADLINE TO REGISTER IS THURSDAY, MARCH 10th. Registration is happening in the Annex at North during lunch on March 3, 4, 7, 8, 9. You can also register by mail. Please e-mail hoops4dana@gmail.com and we will send you a form. If you don’t have a team, let us know and we will group you with other players your age. To RSVP on the Facebook page and to help us spread the word, go here. (this does not count as a pre-registration, though. We must have payment for you to be considered registered). The event is sponsored by Clarkstown North’s Interact Club (Jodi Gottlieb, Lissie Maurer, co-presidents and Jenna Heim, committee member) and Josh Maurer and Danny Heim. Thanks to the Clarkstown School District and the Town of Clarkstown for all of their help on this event. Writer Wednesday is back! I’m very excited this week to feature Nicole Weaver, whose TRIlingual (yes, 3 languages) picture book, Marie and Her Friend the Sea Turtle is out. This is totally my kind of book. I remember buying my friend’s son a Spanish version of Green Eggs and Ham in an attempt to give him a book that exposed him to another language. Nicole does that in her book, with the languages side by side for easier understanding. Nicole weaver was born in Port-au-Prince Haiti. 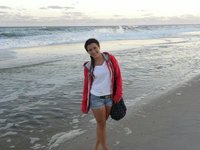 She came to the United States when she was ten years old. She is fluent in Creole, French, Spanish and English. She is a veteran teacher of French and Spanish. 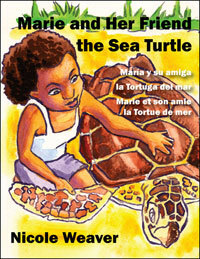 She is the author of a childrenâ€™s trilingual picture book titledÂ Marie and Her Friend the Sea Turtle. The story is about a Haitian little girl who resided by the beach in Haiti. Her second trilingual childrenâ€™s picture book will be published by Guardian Angel Publishing. The book titled, My Sister is my Best Friend will be published in 2011. A delightful story about compassion and the richness of family love and devotion! Esta historia es sobre el amor que se desarrollÃ³ entre una niÃ±a llamaba MarÃ­a y una tortuga que vino a tierra para poner sus huevos. La historia cuenta las dificultades que tenÃ­a MarÃ­a para regresar la tortuga de nuevo al ocÃ©ano. Cette histoire est au sujet de l’amour qui s’est dÃ©veloppÃ© entre une petite fille qui s’appelait Marie et une tortue de mer qui est venue sur le sable pour pondre ses oeufs. L’histoire raconte les dificultÃ©s que Marie a rencontrÃ©es pour remettre la tortue dans l’ocÃ©an. 1) I love the idea of a trilingual book. This is something I would have bought for my kids in a heart beat. Where did the idea for this come from and how do you go about writing it? Did you write the story in one language and then translate or was it simultaneous? I grew up speaking French and Creole, learned English as a third language and Spanish as a fourth. I know from firsthand experiences how important it is to be exposed to a language at an early age. I am a middle school and high school French, Spanish teacher; I wrote the book as a trilingual book so I can use it in my classroom. I see a huge need for books that will introduce children to different cultures and languages. I wrote the story first in English, then translated into French and Spanish. I need to make sure the story is well written in English before I venture out to write the French and Spanish versions. It is more of a challenge for me to write in English than in French and Spanish. 2) What’s the nicest thing someone has said about the book? 3) Have you gotten any letters or reader reactions that surprised you? 4) Where did you grow up? When you were 12, what did you want to be when you grew up? I lived in Port-au-Prince, Haiti the first ten years of my life. I moved to New York when I was ten and had to learn English. I attended college in New York and later moved to Houston. At first, I had my heart set on becoming a translator/interpreter for the United Nations, but changed my mind after working as a French/Spanish tutor at Manhattan Community College. I decided to go to graduate school to become a foreign language teacher. 5) What was your favorite picture book when you were a kid? When I first arrived to the United States, I got hooked on reading the Curious George series. 6) Besides writing, what do you do to fill your days? I am a French and Spanish teacher at the middle and high school levels. 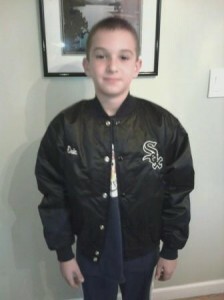 My youngest is a sophomore in high school, he keeps me pretty busy attending his sporting events. 7) If I told you tonight’s dinner was your last meal ever, what would you request? (appetizer, main course, dessert). And the important question: Favorite Chocolate–Dark, Milk or White? I am not a huge fan of chocolate. 9) Is there anything else you want to talk about? Firstly, thanks for interviewing me. 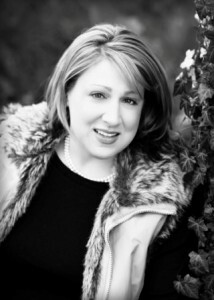 Secondly, I encourage readers to check out my blog at: http://marieandherfriendtheseaturtle.blogspot.com . I donate a portion of proceeds from my book sales for Haiti relief efforts; readers can get more information about the Lambi Fund by visiting their website: www.lambifund.org. Lastly, readers can go here : http://bit.ly/dZ6NO4, to view a recent interview and video about the good the Lambi Fund is doing for earthquake victims. Thank you so much for taking time out of your busy schedule to interview me. Last week we got the awful news that one of my son’s good friends lost his sister in a car accident. She was a beautiful, artistic, smart 17 year old with everything ahead of her. We are aching for this family and for the huge loss to our community. Incidents like these put everything in perspective. They also cause you to grab your kids and hug them till they beg you to stop. And of course, as a writer, you can’t help but peek out of your grief to view the whole thing as, well, a writer. That the situation contains shades of my next book is eerie. Thinking I should use my sadness to take a look at my manuscript with the raw emotion I was feeling, I opened the document. But I read the first few lines and realized the emotion was far too raw and it was all too close. I put my writer-self away. Today, the kids are back at school (okay, all except the one who is sick) and it feels like it’s time to start fresh. Move forward. Time to get the clutter out of my house (my husband and I thought we’d spend the vacation doing this–a thought that was more exciting to me than the beach vacation we are planning for later this year–but we didn’t quite get as much done as we would have liked). If I take 15 minutes a day and throw out a few things, in a month, I bet the place looks much better. Of course it helps that my husband has agreed that I can get rid of some of his old medical books (anyone want a Physician’s Desk Reference from 1993?!). So this is Goal #1. I’m making a renewed push to see my first baby Change of Heart out there (waves hello to anyone who may have found me via Kids Buzz and Shelf Awareness and Dear Reader, etc.!). One of WestSide’s strengths are its Teacher’s Guides and having seen one, I’m now trying to get them into some of the schools so they can see what a wonderful resource it can be. If you are a teacher and would like to see one, send me a note via my contact page. And I’m thrilled that Change of Heart will be on the Summer Reading list for Clarkstown High School South and hope it’ll find it’s way onto more lists. My next book, tentatively titled Callie’s Sister is shaping up. I’m eagerly awaiting my crit partners notes and have been so grateful to get the input of some fabulous teen readers and also my friend Suzanne, a home health care nurse, who has told me that my facts are good (always nice when the facts check out!). So as this week has shown us–savor the little things, hug your kids, appreciate your family and friends and look forward. 2011 promises to be a wonderful year. Life’s been throwing a lot at me lately. Nothing major. Lots of things that I’ll look back on in five years and won’t even remember. But even the minor things can get stressful. So after beating myself up for hours on these and other small matters, it finally occurred to me–I made the best decision I could with the information I had at the time. If you allow yourself that, it’s hard to continue the self-castigating. There’s nothing you would have done differently, knowing exactly what you knew when you made the decision. My husband says I sound a lot like a politician when I chant this (and yes, as I’m writing this, I’m reminded of the whole alleged weapons of mass destruction argument, but I’m going to ignore that). Of course anything that happens in my personal life, I have to try to find the connection with my writing. And I think that this philosophy actually works quite well when you’re working on character motivations. Characters only know what they know at the time they are making their own decisions. Even if you, as the author, know what the future holds for one of your characters, you need to have them function with the knowledge that they have at the time in your story. If any of us, fictional or real, could predict the future, our stories might be quite different. We can’t, therefore we make the best decisions based on the information we have at the time (there I go, repeating it again). Ditto, this for a debut author learning to do promotion. There may have been things that, looking back on my debut year, I might have done differently, but I made the best…well, you get my point. And while I’m at it: A bird in the hand is worth two in the bush. Another lesson we’ve learned this Fall. But that’s a post for another day. Writer Wednesday will return soon. I have to finish revising my WIP and stop obsessing over silly things and finally send some questions to more of the wonderful authors who have volunteered to be interviewed.